As an undergraduate you will benefit from the world-class research facilities, educational resources and amenities that make Southampton one of the best learning environments in the UK. The University’s continued investment in research facilities, totalling £200m over four years, has resulted in a number of state-of-the-art buildings. These include the award-winning EEE building, interdisciplinary Mountbatten Building and the Life Sciences Building, which opened in September 2010. We also have an enviable library service, with five libraries offering a total of 2.6 million publications and a wide range of online resources as well as dedicated study areas and IT facilities. The Student Services Centre is the central point of contact for all student queries. A dedicated team of trained advisors provides up-to-date advice and information about accommodation, enrolment, exams, fees, funding, graduation and ID cards. All of our campuses and halls of residence are equipped with state-of-the-art computer facilities. These include high-speed wireless internet access, network points for laptops and public workstations. Students with a disability, specific learning difficulty or chronic medical condition can take advantage of our specialist equipment and assistive technology. The Southampton University Students’ Union (SUSU), located at Highfield Campus, is the hub of the University social scene. SUSU is led by students for the benefit and interest of students. It's here to represent your voice on issues at local, national and international level. It has fantastic facilities and services which provide a thriving social scene for all our different communities of students. All SUSU members also have access to free and confidential advice and support. The Unilink bus service provides a quick connection for the city’s shops, marinas, bars and restaurants. They also serve the airport, coach and main train stations. 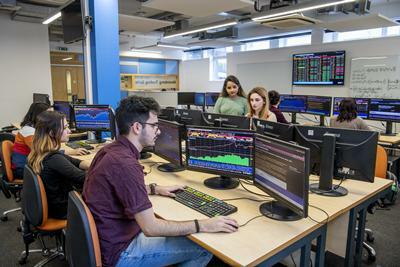 Our students have access to Bloomberg terminals, which are housed in a realistic trading room environment within the Economic, Social and Political Sciences building. These enable access to the most detailed financial data available today and give students valuable hands-on experience of a platform used by major financial institutions and government agencies. Students can also access rich macroeconomic and firm-level financial data through a Datastream terminal in the Hartley Library. A further investment is the experimental laboratory which provides the means to conduct frontier research in decision-making using methods at the interface of experimental and theoretical economics. It attracted me with the high standard of teaching, outstanding sport facilities and the offer of a wide variety of social activities. My choice turned out to be correct.